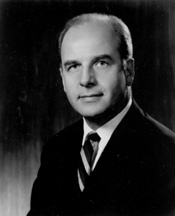 NELSON, Gaylord Anton, a Senator from Wisconsin; born in Clear Lake, Polk County, Wis., June 4, 1916; attended the public schools of Clear Lake; graduated from the San Jose (Calif.) State College in 1939 and from the University of Wisconsin Law School in 1942; admitted to the Wisconsin bar the same year; during the Second World War served as a lieutenant in the United States Army for four years, serving overseas in the Okinawa campaign; engaged in the practice of law in Madison, Wis., in 1946; elected to the State senate in 1948, 1952, and 1956, and served as Democratic floor leader for four years; Governor of Wisconsin 1959-1962; elected as a Democrat to the United States Senate in November 1962 for the term commencing January 3, 1963; subsequently served out his term as Governor until January 7, 1963, and commenced his term in the Senate on January 8, 1963; reelected in 1968 and 1974 and served from January 8, 1963, to January 3, 1981; unsuccessful candidate for reelection in 1980; chairman, Select Committee on Small Business (Ninety-third through Ninety-sixth Congresses), Special Committee on Official Conduct (Ninety-fifth Congress); founder of Earth Day 1970; counselor, The Wilderness Society, Washington, D.C.; awarded the Presidential Medal of Freedom on September 29, 1995; was a resident of Kensington, Md., until his death due to cardiovascular failure on July 3, 2005; remains cremated and buried in family plot in Clear Lake, Wisconsin. Nelson, Gaylord, with Susan Campbell and Paul Wozniak. Beyond Earth Day: Fulfilling the Promise. Madison: University of Wisconsin Press, 2002; Christofferson, Bill. The Man from Clear Lake: Earth Day Founder Gaylord Nelson. Madison: University of Wisconsin Press, 2004.